The United Nations doesn't have Peacekeepers, they have soldiers deployed as Peacekeepers. Peacekeeping missions are not military operations, therefore, Peacekeeper training should better reflect the peaceful mandate of the UN and abandon the militarized culture and tactics present in today's Peacekeeping forces. 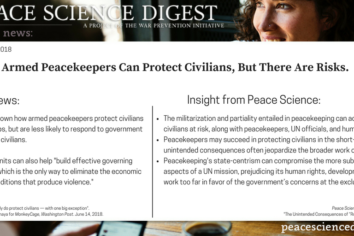 Armed Peacekeepers Can Protect Civilians, But There Are Risks. 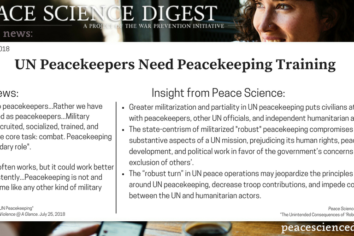 Research has shown that, in most cases, armed UN peacekeepers help protect civilian lives. However, militarizing any part of a peace process is dangerous and is often met with unintended consequences. An upcoming policy forum by the International Peace Institute will explore tensions between the pursuit of political solutions and the protection of civilians in the context of UN peacekeeping missions. 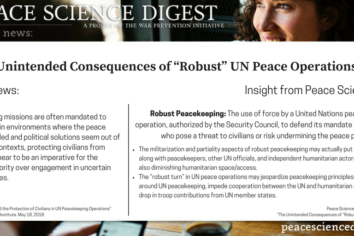 Peace Science shows how the "robust" turn in UN peacekeeping has resulted in unintended consequences to civilians and the peacebuilding process.